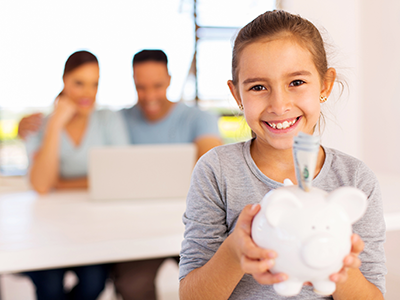 One of the most important lessons you can teach your child is how to save money. If you child makes a small allowance, decides to set up a lemonade stand or receives money as a gift, make him or her save a little. After the course of a few months or a year, hopefully your little one will be able to buy something he or she is really excited about! Trust us, your little one won’t forget the day he or she hands their own money to the cashier for the first time. 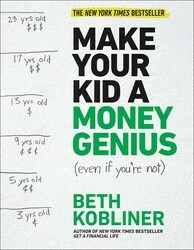 Beth Kobliner, author of MAKE YOUR KID A MONEY GENIUS (EVEN IF YOU’RE NOT) shares her top 6 tricks. Your child doesn’t have to be a monk, shunning all material goods. He doesn’t even have to be super disciplined. He’s just got to know the tricks to help him avoid frittering away his money and instead save those dollars for something he really wants. Here are six smart strategies, inspired by the research of Walter Mischel, the brilliant psychology professor who created the Marshmallow Test decades ago, among other experts. Before you enter a place with temptations, have a game plan. For little kids, you can keep it simple. As you prepare to walk into a store, you can say, “Today we are buying underwear for your brother, and that’s it. So if you see something you want, remind yourself that we are not going to buy it today.” You can add that you will do the same. Letting a child know what to expect and how to react prepares him to resist the urge to make impulse purchases (or throw tantrums about them). By rehearsing his response to the lure of a candy bar or a toy, your kid is (slowly) training his mind to ignore temptation. It’s hard to remember how cool the thing you’re saving for is when you’re staring at a bag of cheesy chips at the checkout line. But focusing on the long-term negative outcome has been shown to be surprisingly effective. “If I spend money on a bag of chips today, then it’ll take me longer to get those Legos that I really want.” When your kid is wavering, commiserate about how tough it can be to wait for something you really want, and give an example of a situation where you had to wait for something. Then praise her after you see her resist an impulse purchase. When your child throws a fit at the checkout line in a store because he will “die if I don’t have gum you have to get me gum buy me gum you don’t love me buy me gum gum gum,” be ready with a story, a joke, an awesome funny-cat or crazy roller-coaster video on your phone, or a special secret that you want him to hear but must swear him to secrecy first. Once you’re out of the store, point out how you really admire that he was able to get it together even though he wanted the candy so badly. Even if he is still a little mad at you, he will realize that the distraction did help make the feeling pass. This is a quirky one, but it’s been shown to work. Encourage your child to think of whatever temptation she is encountering as not real but just a photo or a picture that she can put a “frame” around in her mind. Turns out, some of the most successful waiters in the Marshmallow Test did this naturally. It’s a little abstract for young kids, but some can get into it. Another strategy is to pretend that a treat she wants is covered in ants or worms. In a store, if a kid tells herself that a tempting toy is broken or junky or that a candy is spicy or booger covered, it can work. Sometimes it helps your kid to remove herself emotionally from a tempting situation by “stepping outside” it and asking what someone else would do. Let her decide who that person might be—perhaps a classmate, or her favorite cartoon hero, or just a hypothetical kid who’s smart. Kids like to give advice, and this technique allows them to think more coolly about their choices rather than act on impulse. Break the cycle of childhood stress. Excerpted from Make Your Kid a Money Genius (Even If You’re Not) by Beth Kobliner. Copyright © 2018 by Beth Kobliner. Used by permission of the publisher. All rights reserved. From Beth Kobliner, the author of the bestselling personal finance bible Get a Financial Life—a new, must-have guide showing parents how to teach their children (from toddlers to young adults) to manage money in a smart way.Many of us think we can have the “money talk” when our kids are old enough to get it…which won’t be for years, right? But get this: Research shows that even preschoolers can understand basic money concepts, and a study from Cambridge University confirmed that basic money habits are formed by the age of seven. Oh, and research shows the number one influence on kids’ financial behaviors is mom and dad. Clearly, we can’t afford to wait. Make Your Kid a Money Genius (Even If You’re Not) is a jargon-free, step-by-step guide to help parents of all income levels teach their kids—from ages three to twenty-three—about money. Beth Kobliner is a personal finance commentator, journalist, and the author of the New York Times bestseller Get a Financial Life. She’s currently writing a new book for parents, Make Your Kids a Money Genius (Even If You’re Not). Beth was recently appointed by President Obama to the President’s Advisory Council on Financial Capability for Young Americans, a new bipartisan committee dedicated to increasing the financial know-how of kids of all ages and economic backgrounds. As a member of the last Council, she spearheaded the creation of the national initiative Money as You Grow.